Publishing: Suppress emailing attached files if file is empty? I'm trying to publish users set of data with a criteria through email output. Is there a way to restrict sending mail if there is no data? 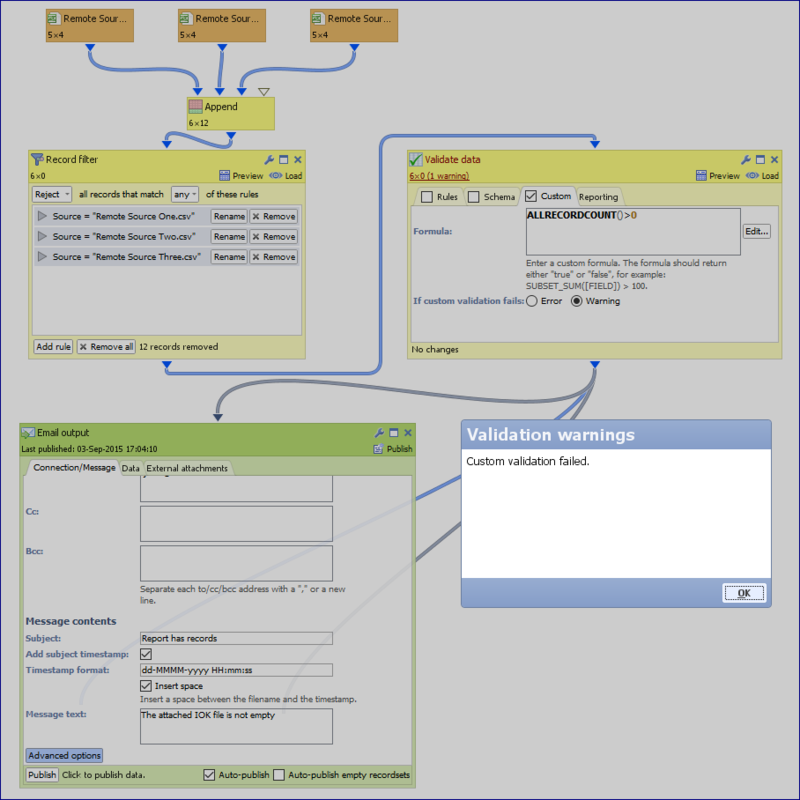 If you are using an Email Output block rather than a Batch Configuration File to manage your automated email publishing and delivery, and you want to add validation steps prior to sending any email Report, consider using the Validate Data Block Reporting Tab to define the logical validations (such as non-empty file) to be applied prior to sending various pre-defined email reports. Thanks for the response. Validate data works fine but we need attach the data in the message text when its successful else should not send mail. 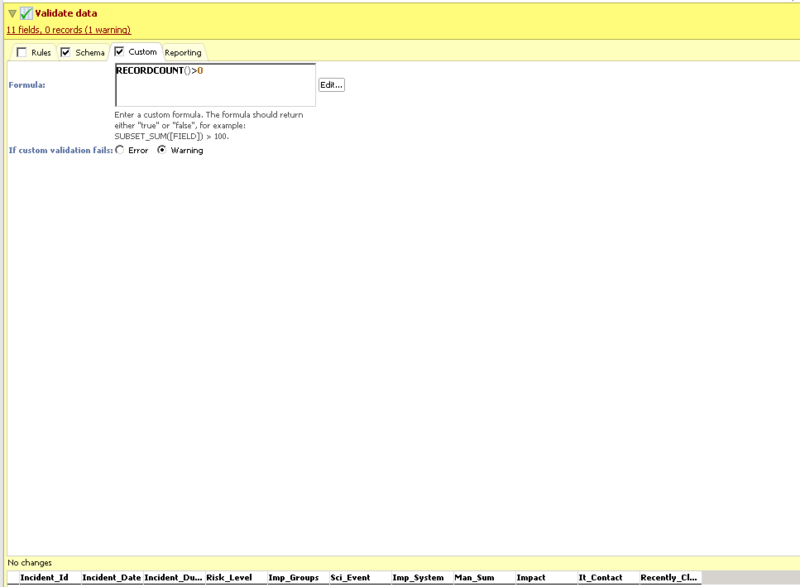 currently iam getting a mail as Validation successful if its having any record else no mail is generated. Can you please further help me on how to attach the data in the email. I have attached the snipping which i had configured in Validate Data. As discussed i used validate data but if the value is 0 its throws an error and I'm getting a chain failure message from the scheduler. how to ignore chain failure if the data is published only when there is no data but should work if the whole chain failed because of someother reason. I set up a test file using row filters to toggle between accepting and rejecting rows to simulate daily refreshes which alternate between refreshing files with non-zero record counts and zero record counts. Note I have used Custom Validation with the formula function ALLRECORDCOUNT tested to be greater than zero. When this Validation succeeds, data set passes to Email Output block and non-zero record report is delivered according to the settings in the Email output block. Note that the Auto-publish box at the bottom of the Email Output block is ticked, but the option to deliver empty data sets via Auto-publish is NOT ticked. If you are having problems with the Scheduler, it may be because you need to include an extra refresh or save task in between file cycles that may be changing from empty to populated. Thanks for getting me the screen shot. I configured the same way but still iam getting a mail with just the header as I'm attaching the the data file under data tab. please find the snipping as attached for your reference. 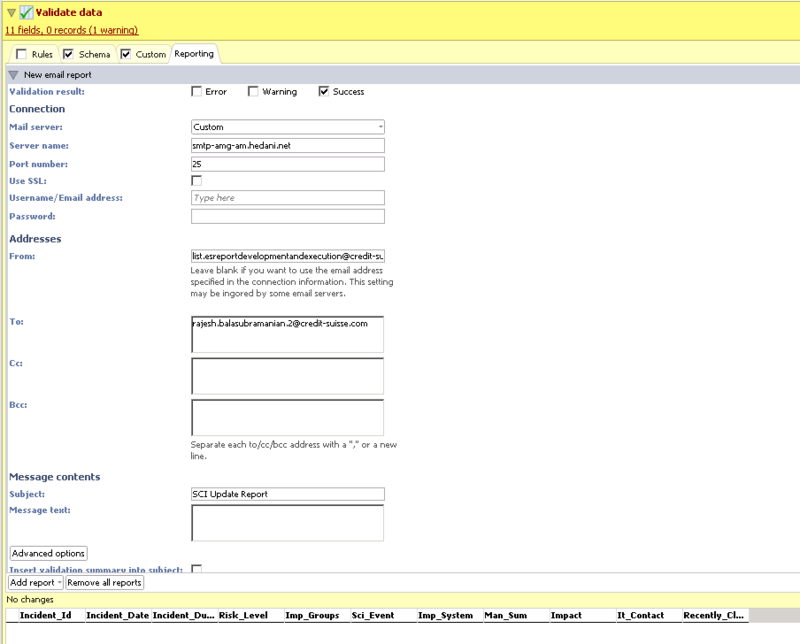 I would like to restrict the email output to publish when there is no records. As discussed over the phone, I will investigate this at try to put together an example using scheduler which meets your requirements. I've discussed this with Richard. Can you let me know a convenient time to call/discuss this issue? Please feel free to send me a private email.